One of the deer family members whose females are also known to have antlers, caribou have large hooves that support the animal movements in snow and to swim through the water. 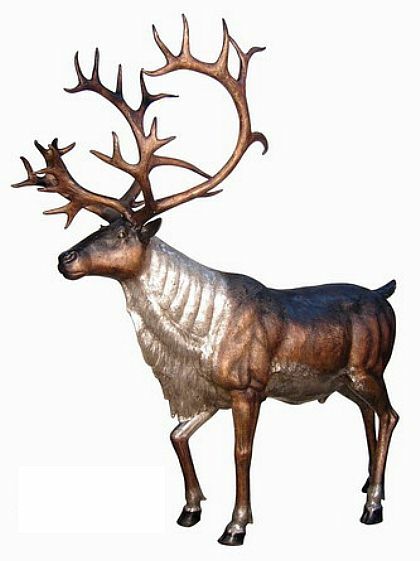 Our life size caribou deer comes beautifully detailed for outdoor use. Caribous are also known as reindeers. Dimensions: 90"H x 85" x 36"
Did you know that there are about 9 subspecies of Caribou? Of the nine, 6 species are known to reside in North America. Caribou can vary in shades of dark reddish brown with white neck to sometimes a shade of all white. These animals are usually larger than the white-tailed but smaller than the elk. Although female Caribous are known to have antlers, the size of their antlers will still pale in comparison to the male antlers which are much larger.